Good morning. Thank you for the opportunity to be here and to speak in honor of Millie. 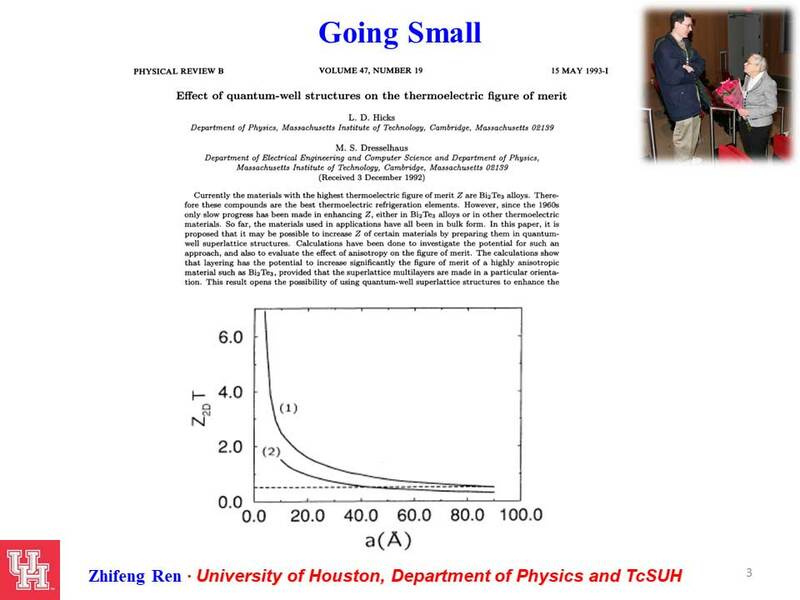 I'm Zhifeng Ren from University of Houston Physics Department. 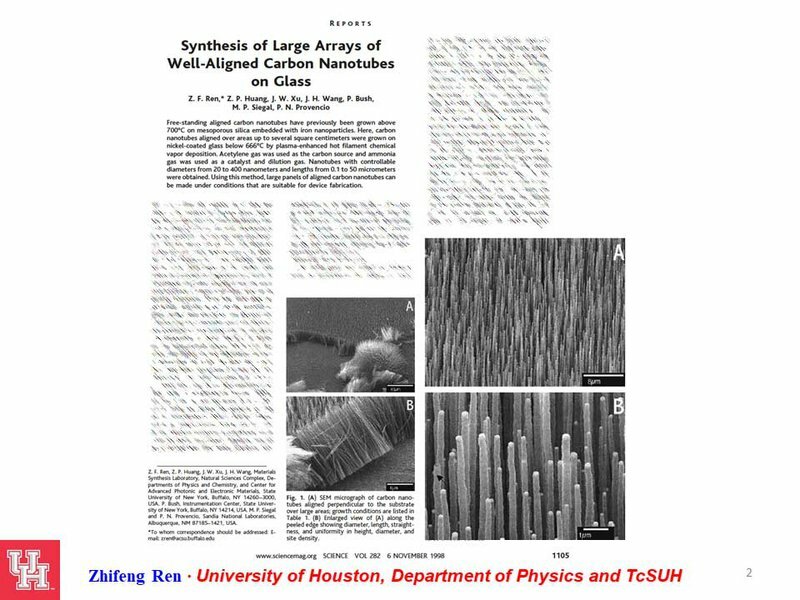 I first got to know Millie’s work in 1998, when I worked and published a paper on aligned carbon nanotubes. And then, early in 1999, I met her personally in the Kirshburg meeting. 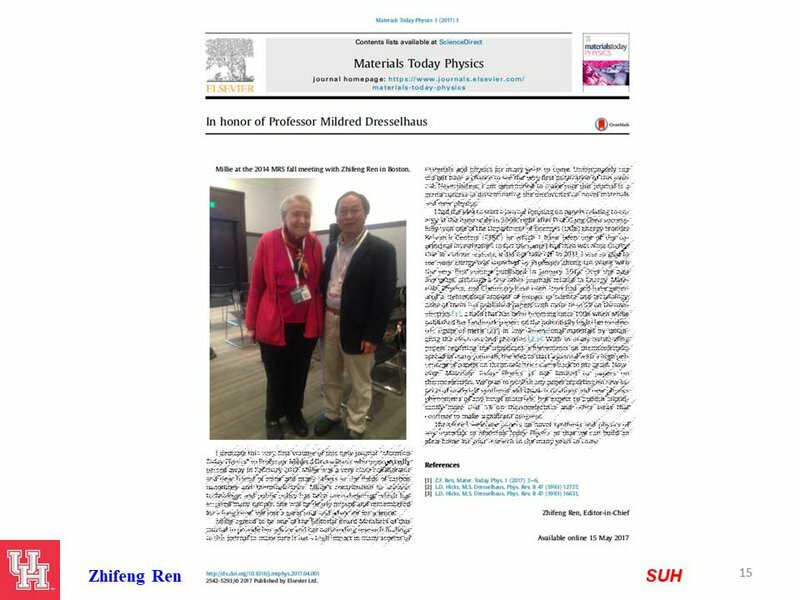 Of course, I got to know her much better after Gang Chen moved to MIT in 2001, and he and I started working together on thermoelectrics. And then we noticed Millie’s very important historical work (the 1993 paper from Lyndon Hicks), on low dimensional nanostructures and their applications in thermoelectrics. 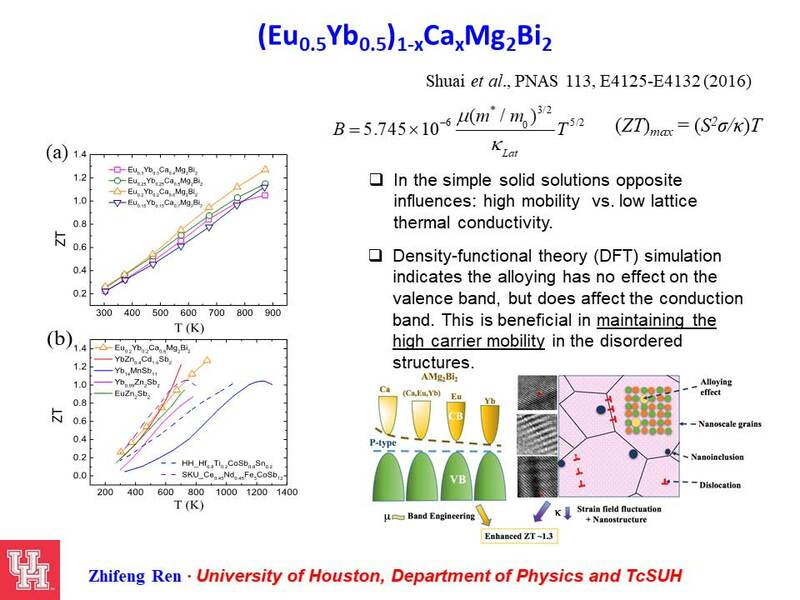 Gang and I had been thinking how to make a new bulk material instead of a superlattice or nanostructure film. 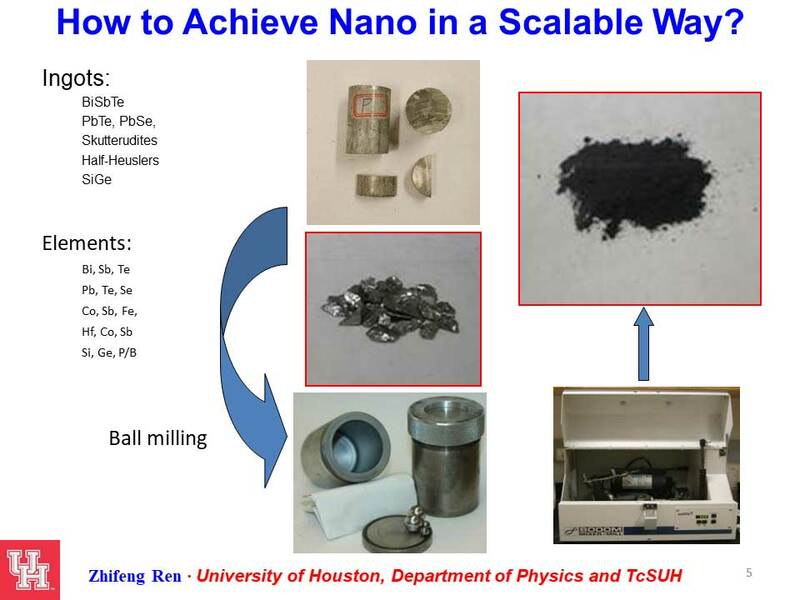 We, together, had the idea of creating a nanocomposite and making nano bulk materials. 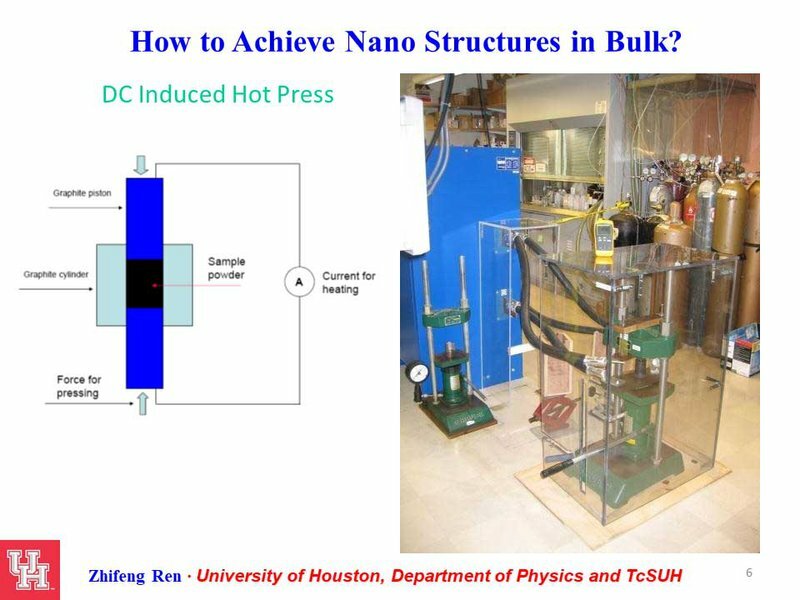 The method we adopted to do this ball milling and hot pressing was pretty well established in other fields, but had not really been adopted so well by the whole thermoelectrics community. So we first created the nanocomposite powder by ball milling, and then we used a hot press to compact them into dense bulk materials. As it turned out, these nanostructured bulk materials not only had better properties, which I’ll be getting into in more detail later in this talk, they also had much better mechanical strength because bismuth telluride is not normally able to be cut into a 0.1 mm or 0.2 mm thickness, because the cleavage was a big issue. But with our nanostructure, the material had enough strength to allow us to cut right through it without breaking it! After that first demonstration of the advantages of this bulk material, we published a paper and Millie was a co-author. We took her advice through discussion, of course, and we first demonstrated the figure of merit — our nanostructure had about 1.4 peak ZT, which is 40% over the bulk structure. 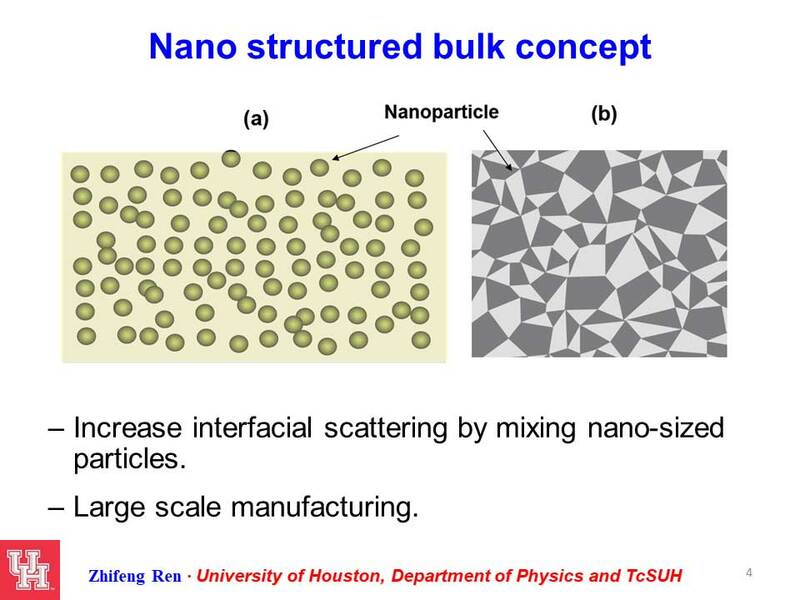 Ever since, a lot of people have been working on creating nano bulk materials like this. 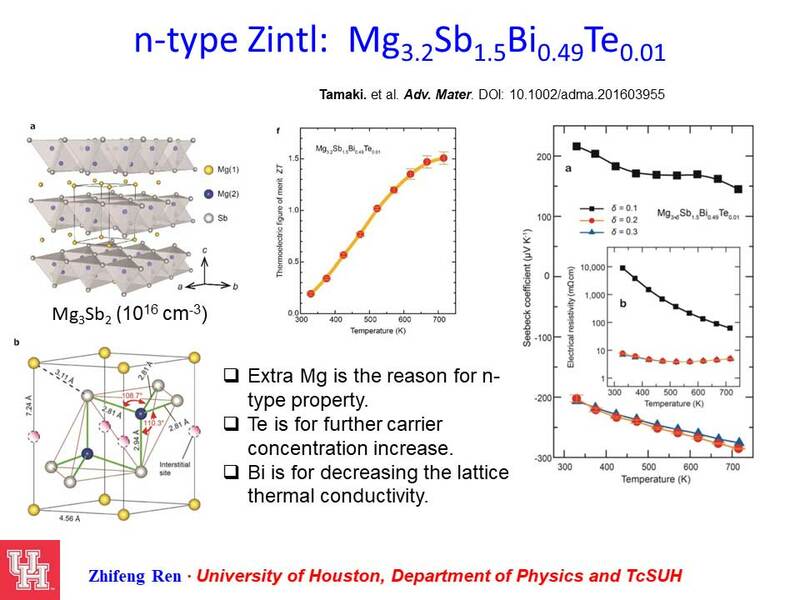 Normally, before that, ZT was below 1, and afterwards, many materials — both N-type and P-type — have ZT above 1. So it’s obvious what impact Millie had in thermoelectrics. Simply rereading her paper can inspire us! Over the years, I have had the privilege of publishing papers with Millie, we published a total of 24 papers. We published 4 papers on carbon nanotubes early on, and later, we published 20 papers on thermoelectrics. 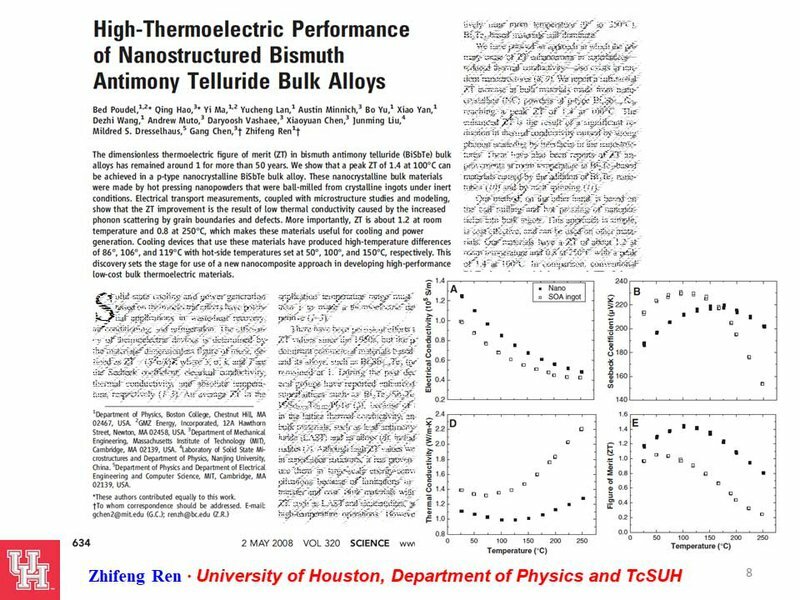 10 of those 20 papers on thermoelectrics were highly cited, and the total citation reached more than 8,000 times within a few years. We also had quite a few grants together, many led by Millie and Gang Chen from NASA, NSF, DOE, and also Jos Heremans, for the one from the air force. So quite a lot of projects have been done under the influence of Millie. About a year ago, I decided to start a journal with Elsevier called "Materials Today Physics." 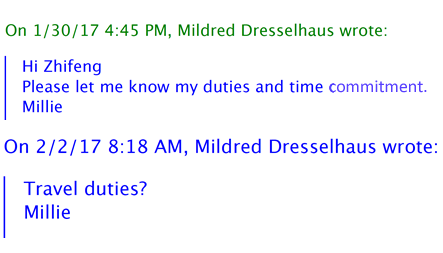 And on January 30, 2017, I asked Millie whether she was willing to serve on the Editorial Board. So we got her! We were so fortunate to have her on the board, and we were so excited! Unfortunately, she left us before even the first issue of the journal was published. We were very sad about this. Here is the first volume of the journal. 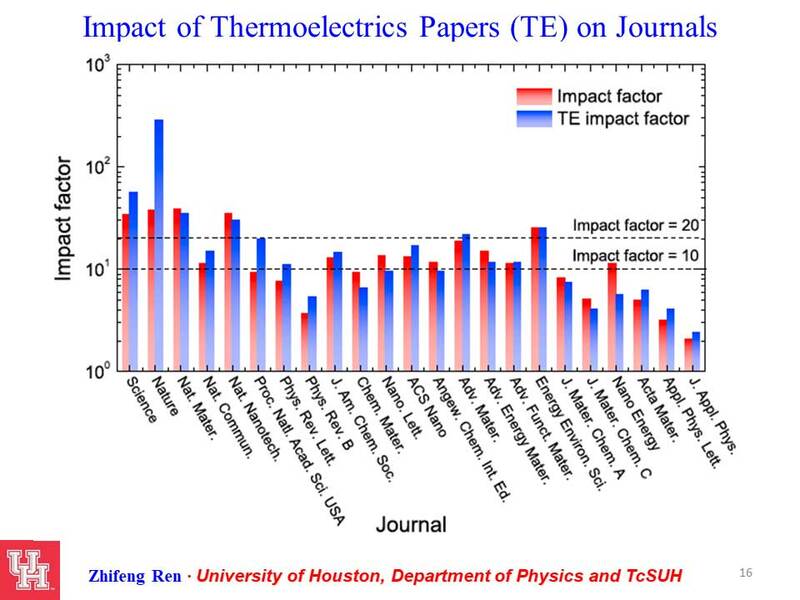 You can see that we’re publishing quite a few papers on thermoelectrics research and also some review papers. We hope it’s going to be a very good journal. And in the editorial, in honor of Professor Millie Dresselhaus, I wrote a one-page article dedicated to her life and her story, and — of course — mentioning her monumental importance she had to the field. Over the years, we have been collaborating with Millie, but we never took too many pictures with her. Fortunately, back in 2014, I had the privilege to take a photo with her at an MRS meeting. That was fortunate and very lucky. I always assumed I’d be able to take photos later; I did not know there wouldn’t be a later chance. Later, I did another editorial article that really centered on Millie's impact on thermoelectrics. And I showed this visually, in a very simple way. As you can see, in most of the journals I studied, articles about thermoelectrics have contributed more to the impact factor of the journal. A lot of that is thanks to Millie and the way she really opened up this field. 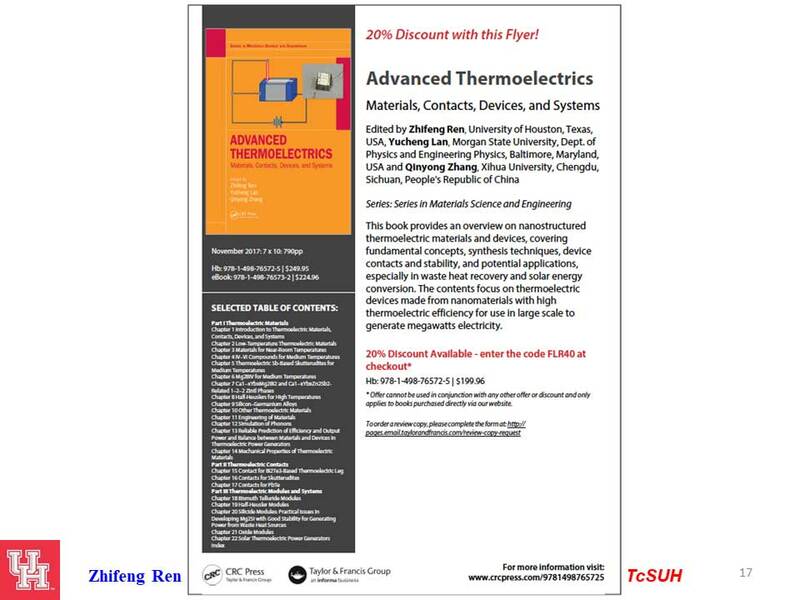 Starting at the end of 2016, I began writing a book: Advanced Thermoelectrics in Materials, Contact Devices, and Systems. There were over 22 chapters, but every single chapter was written under Millie’s influence and direction. In fact, the book has already been published. You can get that book (click here). Finally, let me say something about the new work we are doing. 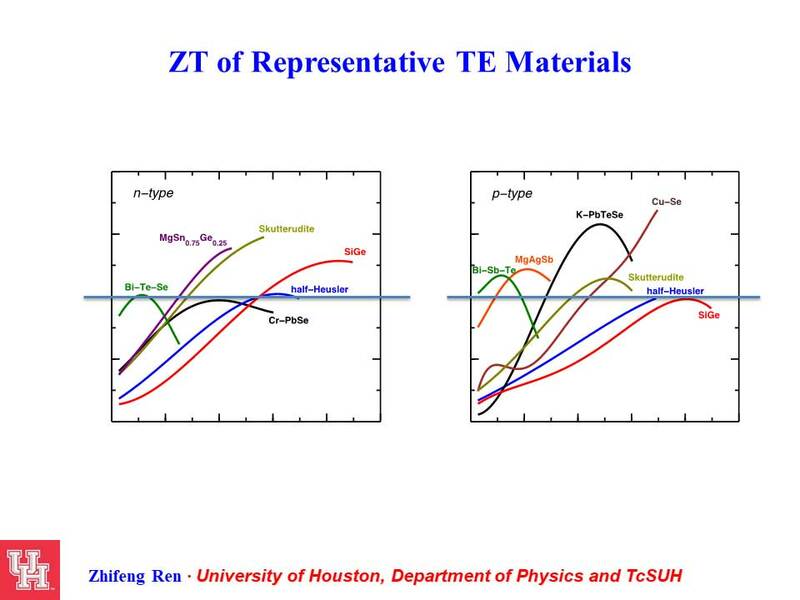 As Gang mentioned in the introduction, the goal in thermoelectrics is to get a high power factor and a high ZT. Of course, those two things don’t always go together. In some systems, you can get a very high ZT, but the power factor is very low. That made the power output density very low — not nearly high enough to do anything useful! So we were able to find a new half-Heusler material called niobium-iron-antimony (NbFeSb) with a power factor, at room temperature, of over 100. As Jos Heremans pointed out earlier, materials at room temperature normally have a power factor of about 40. But our material had a power factor over 100! In fact, even when you heated it up to 700℃, the power factor still hovered at about 50. 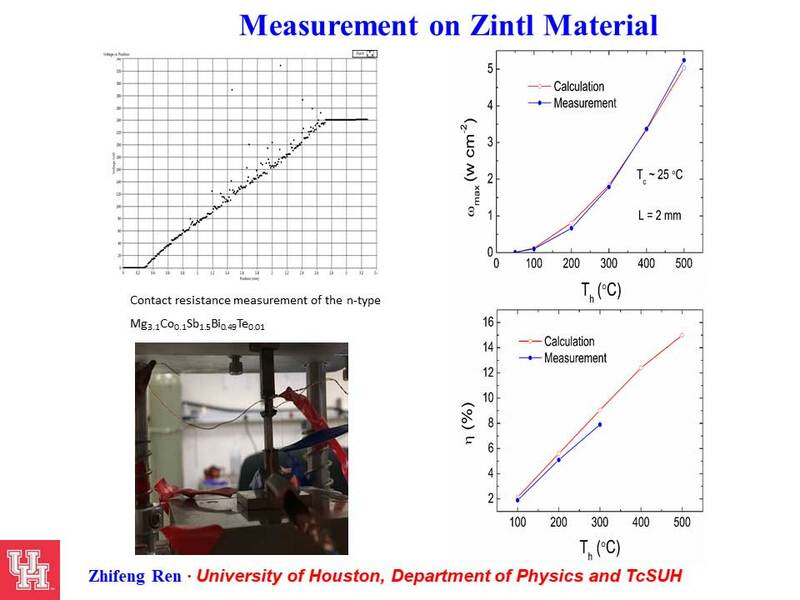 Most recently, we have been working on a new type of materials called “Zintl-materials.” Zintl materials normally have many different kinds of structures, and their ZT is a little below 1. But we wanted to look into them in a little more depth. The first material we worked on was a P-type material and remarkably, we were able to increase the peak ZT of the P-type Zintl to 1.3. Now, if you look at literature, you’ll find that over many years, people have tried and tried and tried to get N-type Zintl-materials, but no one has been successful. 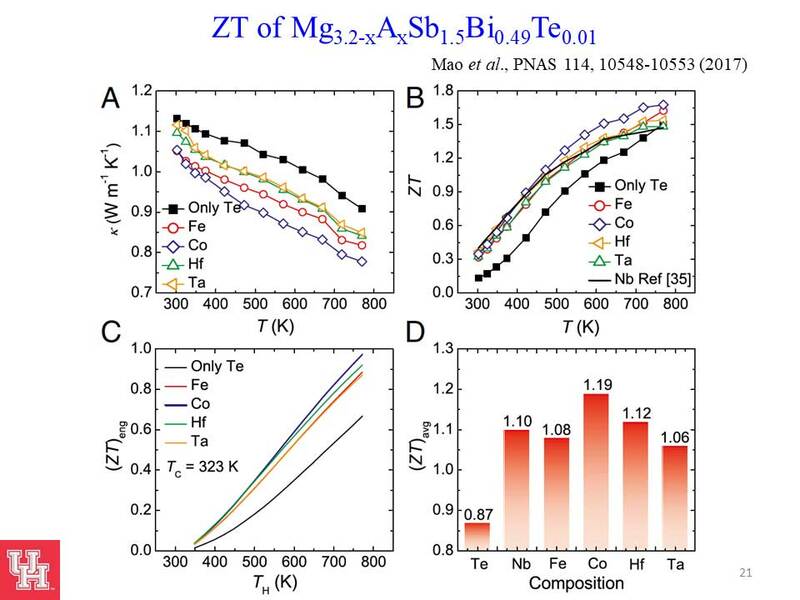 Then, about 2 years ago, at the Wuhan International Conference on Thermoelectrics, a Japanese group led by Tamaki reported that they’d found an N-type Zintl whose base composition was magnesium antimony bismuth with a little bit of tellurium-doped to tune electron carrier concentration. And when they tested it, they suddenly got ZT of 1.5 — for an N-type! Now, a 1.5 ZT would be a breakthrough for any thermoelectric material. It’s even more astonishing for an N-type Zintl. However, if you really look into the details on what they found, you’ll discover that the electrical conductivity of this material is still very low — only 10⁴. So that’s why my group immediately started looking at it. Is it possible we could further improve the electrical conductivity? Because that would make it a very useful material! We decided to try this by doping not just the bismuth side, but also the magnesium side — and that we’d dope the substance using different kinds of elements, to see if we got different effects. For example, we used iron, cobalt, hafnium, tantalum, and (of course) niobium. This wound up being a good instinct, because sure enough, different elements changed the properties of this material. And by properties, I don’t just mean the thermal conductivity, which we were looking for; it changed other properties, too. 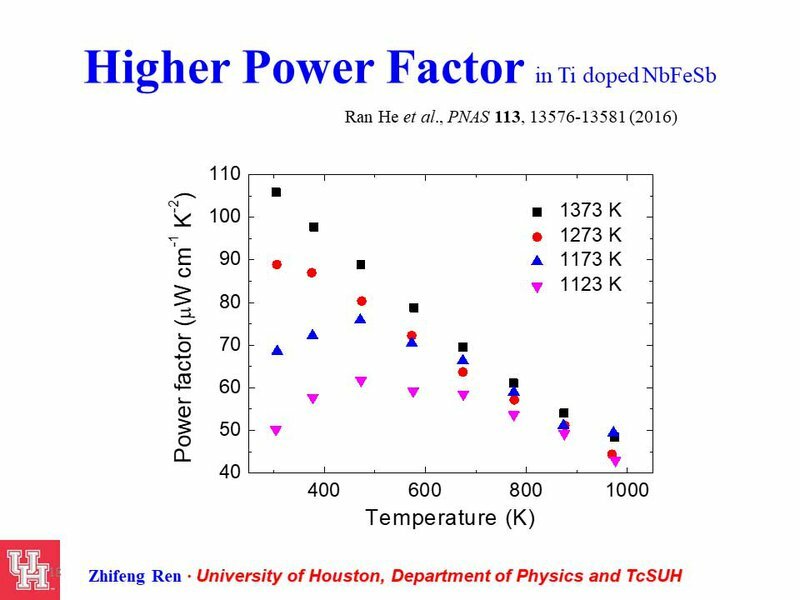 In the end, we were able to decrease the thermal conductivity and also significantly increase the power factor. The ZT was improved for a temperature range of room temperature to 500℃. You can see, in the slide above, that the ZT for cobalt is about 1.2. Once we had this material, we still had a few more measurements to make. First, we tried to make contact — and we've made some contact successfully, enough to determine that there’s no issue with any contact resistance. Then, we measured the efficiency of the material, and although we were only able to measure up to 300℃, we demonstrated that the efficiency is about 8%. Why can we only measure up to 300℃? I think probably it's due to the contact, somehow. During the measurement, it goes above 300. There is a stress issue, which means that you really destroy the contact and we're still trying to figure that out that. With that, I’d like to conclude by saying that Millie’s impact on the scientific community is unbelievable. And it will continue to be so for many more years to come. I really appreciate having the opportunity, over the years, when I was at Boston College, to work with Millie and be inspired by her guidance, her patience, and her passion. She pushed me to live up to my full potential and I hope to keep that momentum going for many more years to come.